Lunge your way to Faster Bike & Run splits. Just like the Squat, it is a primal Movement as well. Critical in athletics and being the best Human you can be. WHY should every Triathlete do these quad building exercises? Great Question! It is one of the absolute best exercises to help you push a big gear on the bike & attack those hills on the run. This movement also isolates each leg, focusing on muscular balance & proprioception. Making sure you are more effective, efficient and bullet proof in your training and racing. 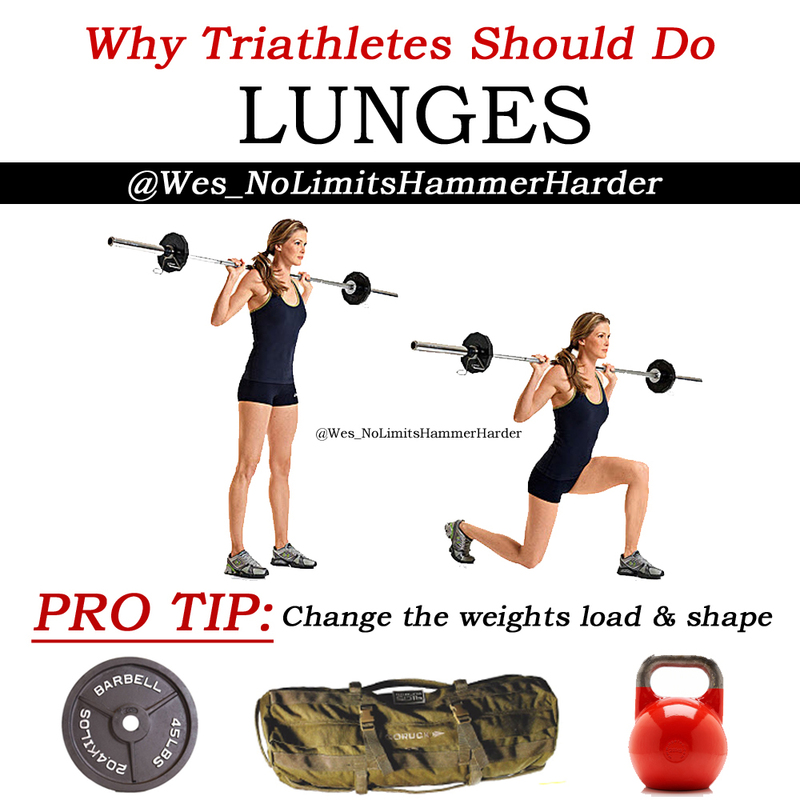 ⭐️If you want more Power on the Bike & more Propulsion on the Run.....then add Lunges into your weekly strength routine. Build slowly up to a Heavy weight. Once you are there, 2 or 3 sets of 4-8 reps on each leg. The reason I like heavy weight and fewer reps is it maximizes strength without maximum fatigue. The short version is, lighter weight paired with a lot of reps can fatigue you to the point where your next endurance based workout suffers. Your goal is to get stronger for your sports performance. Not trash your legs for next few days. I like to use the word "compliment" your sport specific training. 1️⃣You can use walking lunges as a warm up prior to runs. 2️⃣Be careful that your knee does not track past (forward) your toe. You do not want to over stress the patellar tendon and risk tendinitis. Use the subject title LUNGE QUESTIONS. Break out the Big Ring, we are focusing on increasing our ability to produce FORCE. More simply put, we are going to build Leg Strength. Its fairly logical that we as cyclist would want stronger legs. But WHY? Force is half of the Power equation. The more Force we can produce the more Power we can produce and we can be versatile on how we produce the Force. Bonus: You will never have to worry about walking your bike up a hill! I usually take on 1-3 NEW clients per month. If you are interested in my On line Coaching: Triathlon, Running, Cycling, Strength or Weight loss. Just shoot me an email and I will get back to you ASAP! Do you know someone who would enjoy this article? GREAT! Feel free to forward, share or pass it on via a messenger pigeon. But WAIT there is more....said in a cheesy sales voice....seriously though. Newer PostRace Day Hydration; Control what you can control!